Apart from these, Honours Course and Computer Science as a subject are also available for B.A./B.Com students. 2. Every student seeking admission must have a valid e-mail account and mobile number. This e- mail ID and mobile number must be mentioned in the admission form and should be kept activated. 3. Admission in M.Sc. (Physics), M.Sc. (Chemistry) & M.Com. (B.I.) will be according to merit based on CETPG admission test and merit in lower examination. 4. Admission in B.Com. IST Semester will be allowed according to the rules and directions lay down by Panjab University, Chandigarh. 5. Admission to B.A./ B.Sc./ B.Com. / M.A./ M.Com./ M.Sc. IST Semester will be based on merit only. Students seeking admission in B.A./ B.Sc./ B.Com. /M.A./M.Sc./M.Com. 3rd semester, the preference for admission will be given to the old students. 6. For admission in M.A. IST semester, the marks obtained by candidate in concerned subject will be added to the total marks secured by him/ her in B.A. for any concerned subject. Students who have passed honours subjects will be given an additional weightage of 5% of the total marks obtained in concerned subjects. Up to a maximum of 4% for distinction in any or all of the following co-curricular activities, achieved in any of the 3 years preceding the year of admission. 1. Volunteer who has completed 120 hours of NSS work under regular activities. 2. Participating in one (Seven days) camp under special camping programme. 3. One Blood donation or Motivation for blood donation. (f) Programme aimed at creating awareness for improvement of the status of women. 1. Volunteer who has completed 240 hours of NSS work under regular activities. 2. Participating in two (Seven days) camp under special camping programme. 1. Volunteer who has completed 360 hours of NSS work under regular activities. 2. Participating in three (Seven days) camp under special camping programme. 8. The student who has already passed M.A. in any subject will not be eligible for admission to any post graduate course. 9. The student who fails to bring their detail marks card at the time of admissions will not be considered & their merit will be fixed assuring 35% marks in the concerned subject. 10. If a candidate has not studied in the particular subject at under graduate level, he/she will be given zero weightage for the same and placed in the merit list accordingly. Functional English will not be considered equivalent to Elective English. Candidates who have not studied Mathematics or Geography at under graduate level will not be eligible for the respective Post Graduate courses. 11. Students with compartment case except Panjab University will not be eligible for admission in post-graduation. 12. The candidate joining B.Sc. must have secured 40% in aggregate, B.A. candidate must have at least obtained 33% in aggregate, for joining in B.Com. aggregate required is at least 45% and if applicant is from B.A. aggregate required is 50% and 20% in the subject of compartment only if seats are available for the compartment cases. 13. Gap cases will be entertained for admission to any course if genuine cause of gap is made clear by the candidate. A self attested declaration is necessary to be produced by the candidate on the time of admission. 14. Candidates failing in 50% of subjects in lower examination will not be eligible for the admission. 15. Candidate can be refused admission in a subject in B.A. IST Semester if the number of candidates per section in that subject exceeds the prescribed limit. A candidate desirous of opting for some optional subject in M.A may be selected on the basis of test. For change in subject one month time is given after admission to the student. Only that subject can be opted for which are available in the groups of PU/ Prospectus. 16. The students, rendered not eligible by university/board owing to adopting unfair means or any other reason, will not be entertained. 17. The admission is done as per the rules and directions issued by the Panjab University. The final right of approval of admission rests with the university. In case the candidature of a student is cancelled by the university, the college will not be liable for the same. a) Date of birth Certificate/ Metric. b) Character Certificate from last Institution. c) Detail mark Sheet/Certificate from last class passed. d) Two same passport size photographs. e) Blood group Certificate from recognized lab or Doctor. f) Equivalence Certificate from the students who pass the last examination except PU and CBSE Board. 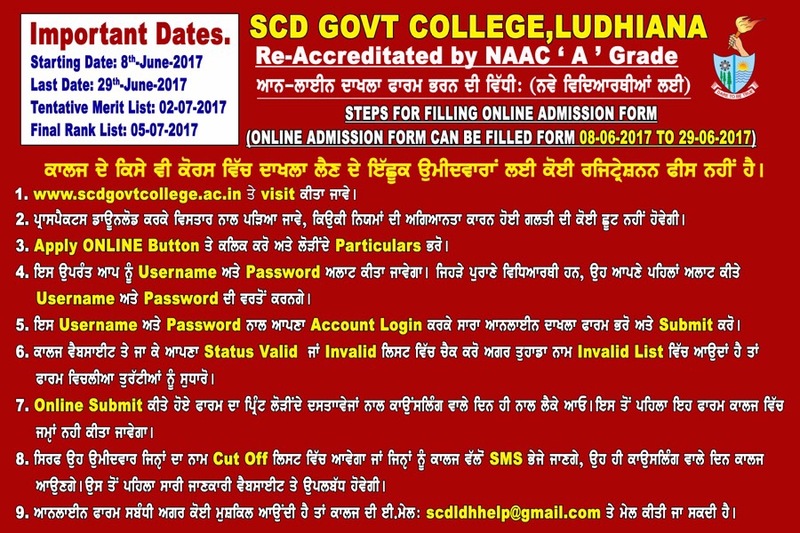 g) Reservation Certificates are needed for all the categories in which applied for, they have to be presented at the time of counseling. Income Certificate of Family is required for the SC students. h) For admission to Evening College, job certificate must be attached on the prescribed form and form must be submitted at the time of counseling. Form will not be shifted from morning to evening college or vice-versa. Note: All the Certificates mentioned above must be presented in original at the time of counseling with online application form. 19. If the result of the class is not declared by Panjab University/board, student can submit/update their forms within three days of declaration of result. In such a condition the interview will be on the next day or as stated. 20. The Tentative admission list will be displayed on the website on 2nd July, 2017 and Final list on 5th July, 2017. The candidates seeking admission will have to appear for interview, on receipt of SMS on the mobile number mentioned on admission form. Name in the merit list does not guarantee admission. The admission process will be completed only after the interview when the candidate deposits the fee of the course. The candidate must bring his original certificate at the time of interview. 21. In case a candidate is eligible for admission he/she will have to deposit the fee/ funds as per challan generated before the last date mentioned on the challan. The approximate fees structure is displayed on website. If a candidate does not deposit the fee, their candidature for the course will be cancelled and the seat will be given to next candidate in the merit list. 22. Hostel admission form will be issued only after presenting the receipt of the college admission fee deposited. 23. The Principal is authorized to change any rule as per Punjab Government / Panjab University directions. 24. If any information in the form is found incorrect the admission will be cancelled immediately. In such a case deposited fees will not be returned. 25. No form/ document/ photograph will be returned to the students who fail to get admission. Submit the college copy of fee receipt to the college fee clerk. Any information regarding the admissions and other important information will be displayed on the college website. The candidates must visit the college web-site for any information on daily basis. 1. Loitering in the college corridors and elsewhere in the campus during free periods is strictly prohibited. 2. Trespassing in the hockey ground is prohibited. 3. No student is allowed to paste any kind of notice on or around the college notice-board. 4. Parents are advised to keep in touch with the teachers so as to monitor the progress of their wards from time to time. They will not be informed through post. The list of absentees and the names struck off from the college will be displayed on the college notice-board. 5. Maintenance of discipline in the college is the responsibility of each and every student. Strict action will be taken against students who create indiscipline in the college. 6. Mobile phones must be kept switched off during classes. In case the phone rings in the class, or the student plays music in the college campus, the mobile phone will be impounded, and along with penalty, strict disciplinary action will be taken against the student. 7. Students should not bring any outsider in the college campus. 8. Students who disregard or violate the above mentioned instructions will be heavily fined. Their re-admission may be not permitted. 9. As per S.L.P(C) no. 25295/2004 of the Hon’ble Supreme Court ragging shall not be permitted. Ragging is a criminal offence punishable by law. 10. Sexual Harassment Cell of the college is empowered to look into gender sensitive issues / complaints and take appropriate action. 11. Every student, seeking admission in Evening College, shall submit his employment Bio-Data form at the time of admission. This form shall be available with the convener of the Evening College admission committee and is available at the college website also. 12. Students must carry their identity cards at all times within college campus, as they can be asked to present it any time. 13. It is for the benefit of the students that they read/visit the notice-board/website daily because all important information will be displayed on the college notice-board/ website of the college. Failing to read the notice-board on daily basis may deprive the students of important / urgent information and to sole responsibility rests with the students themselves. 14. Using foul language and wearing indecent attire in the college is strictly prohibited. 15. The Degrees during annual convocation will be presented to only those graduates and post graduates, who attain more than 60 percent marks in Panjab University examination.